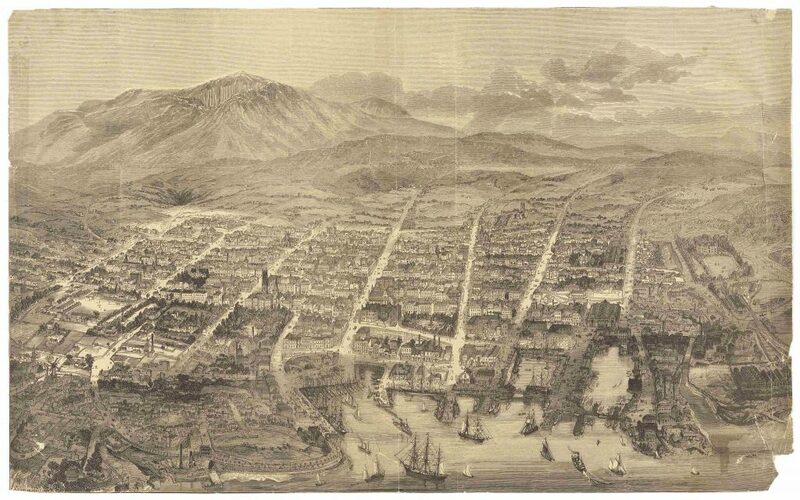 The question of how to defend Hobart dates back to the very beginning of the colony. When French invasion threatened in 1811, naval ship guns on wooden platforms were installed beneath the old Government House (where Franklin Square now stands). 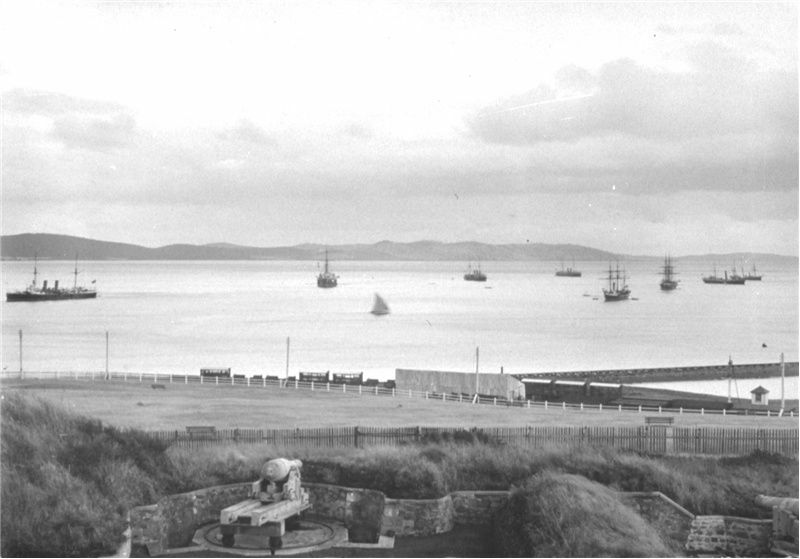 The battery at Mulgrave Point was constructed in 1818 and more batteries followed between 1841 and 1885: at the aptly-named Battery Point, at Macquarie Point, on the Domain, at Sandy Bay, and on Kangaroo Bluff. Why were there so many guns? Part of the answer lies many thousands of miles to the north, and to the periodic war scares of the so-called “Great Game,” the contest between the British and Russian Empires. Throughout the nineteenth century, Anglo-Russian tensions sparked conflicts around the globe (including the First Afghan War from 1839-1842, the Crimean War from 1854-1856, the Second Afghan War from 1878-1879, and the Bulgarian Crisis of 1881). It spawned networks of running spies and counter-espionage that crossed the Indian subcontinent and Central Asia, and gave rise to great characters in literature (including Dr. John Watson of Sherlock Holmes fame, and Rudyard Kipling’s Kim). 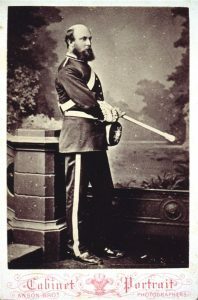 Major E.L. Crowther, Southern Tasmanian Volunteer Artillery, c 1880. Joining the volunteer defence force was a real badge of honor. Members were drawn from across the social classes – from the colonial elite (like Thomas Roblin, a museum curator), to those from more humble backgrounds (like Charles Read, a baker at Cascades). Dr. Edward Lodewyk Crowther (1843–1931) was a Major in the force, and wrote a brief history of the volunteer effort (which you can find in the massive collection donated to the State Library by his son, William Edward Lodewyk Hamilton Crowther). 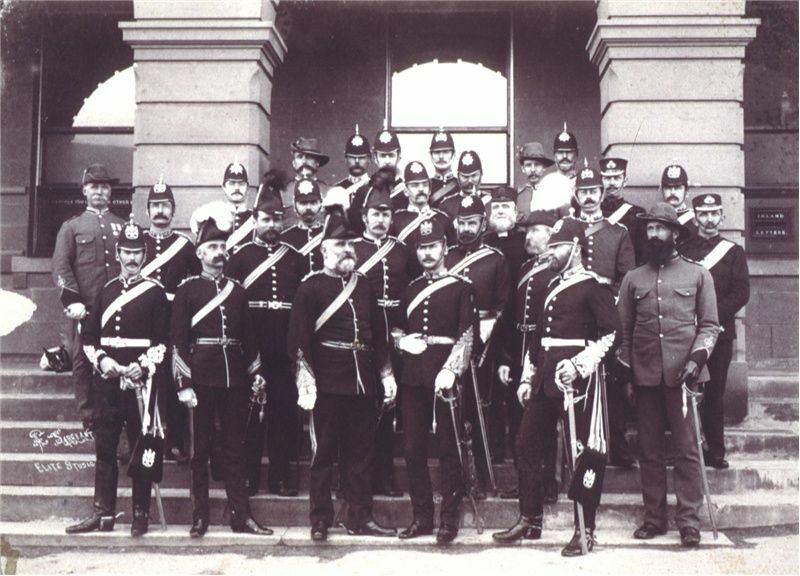 The Crowthers were the cream of colonial society, but if you were trying to climb the social ladder, wearing these splendid uniforms and rubbing shoulders with Hobart’s elite was a solid route to respectability. So, too, were the opportunities to join in parades or to participate in community social functions, like a “Grand Promenade Concert” that the Southern Volunteer Artillery put on in the Town Hall in 1878. But beware! Any whiff that you might join up just for the fun of it might get you teased in the local papers. 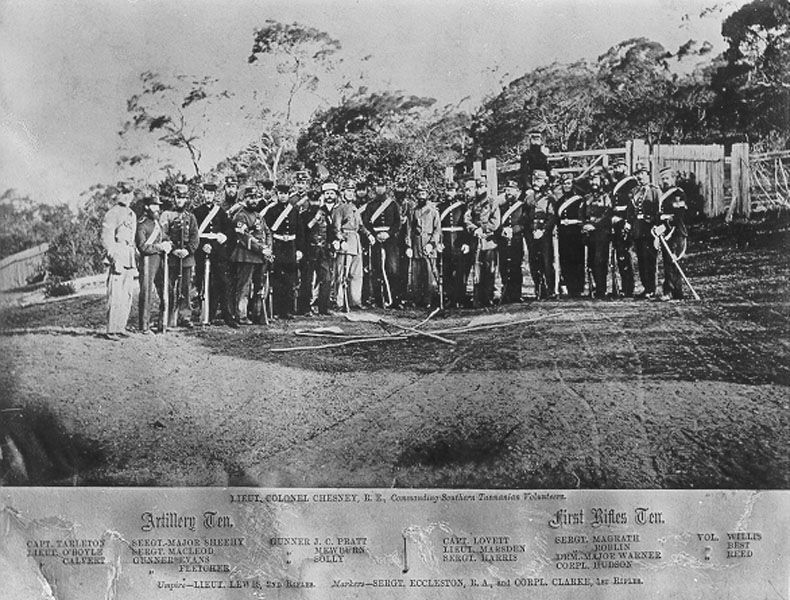 Southern Tasmanian Volunteers regiment, with some individuals named. TAHO, PH30/1/469. The story of the Southern Volunteer Artillery is much bigger than we could possibly tell here, and it’s about to get even more interesting. You can now view the Registers of Volunteers of the Southern Tasmanian Volunteer Artillery (COM1/20) on our website, and thanks to our amazing digital volunteers, you can also search search for individuals in our Tasmanian Names Index, and maybe even write your own part of the story! We’re not quite finished with this project, and we have many more lined up. If you’d like to participate, please check out our DigiVol Expeditions here. You can register as a digital volunteer and help us transcribe these and other records that tell amazing Tasmanian stories. You can visit the gun emplacements at Alexandra Battery, and see some of the original guns on display at the Army Museum of Tasmania at Anglesea Barracks in Davey Street. Our colleagues at the National Archives have a digitized history of the Southern Volunteer Artillery, written in 1925 which you can view online here. There’s also heaps more to discover about the Southern Tasmanian Volunteers in our collections – check out this list here. COM1/20, Registers of Volunteers Enrolled in the Southern Tasmanian Volunteer Artillery, with details of Equipment issued and Subsequent History, “A” Battery. William Dalrymple, The Return of a King: Shah Shuja and the First Battle for Afghanistan. New York : Alfred A. Knopf, 2013. Game and the Race for Empire in Central Asia. Washington, DC : Counterpoint, 1999. Douglas Morris Wyatt. Tasmanian Colonial Artillery, 1803-1903. The University of Chicago Library has an amazing collection of 19th century maps that show the changing relationship between British and Russian borders in the nineteenth century. You can click on different regions of the map, or test your Cyrillic skills by browsing the list. A well-written story, thanks Anna! Love the photo of the Queen’s battery. Do we know if any of it remains?